Soar in the trees, paddle, fish and sleep tight. You may have seen Southern Oregon’s rolling hills and valleys, snow-capped mountains, roaring rivers and a piercing blue, famous body of water by the name of Crater Lake. 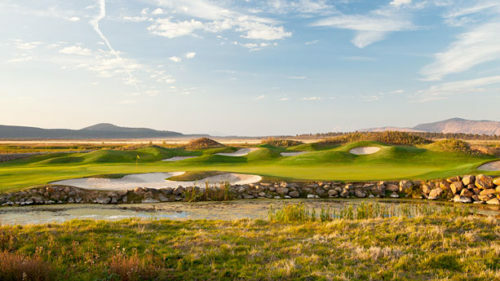 You may not have known how easy it is to make Klamath Falls your basecamp for adventure in this region — where you can spend three glorious days making epic family memories. Soar through the treetops, fish for trout, take in vintage movies at dusk, recharge lakeside with views of Mt. McLoughlin, paddle your kayak along a bubbling creek, and dine and sleep in style to fully recharge. 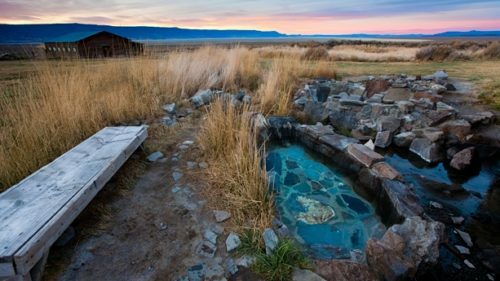 Here’s how to make time slow down with a long family weekend in Klamath Falls. Spend your first day soaring when you visit Crater Lake Zipline. With nearly a mile and a half of zip lines and a course designed especially for kids, visitors of all ages can take this heart-pumping leap into the wild. 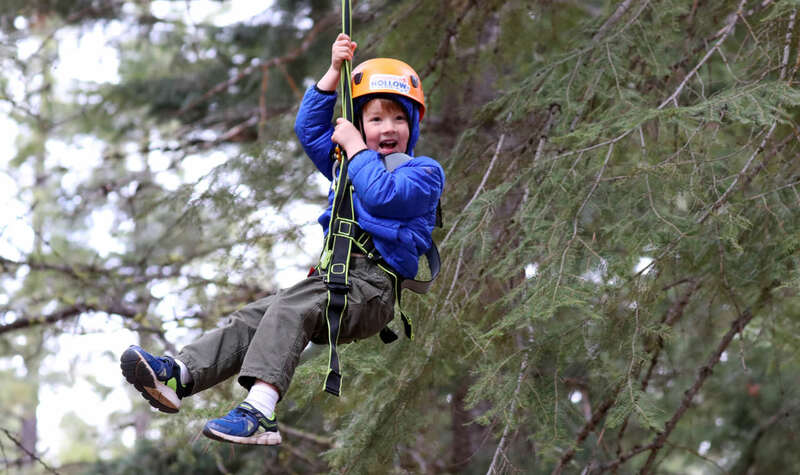 Sasquatch Hollow, the children’s course that opened in spring 2018, takes kids (40 to 170 pounds) on an obstacle challenge with ziplines, swaying aerial bridges and a treetop spider web to climb. The adult version (70 to 250 pounds) will see you flying up to 100 feet in the air on nine different ziplines with views of the high Cascades. Never taken a zip-line tour before? No problem. 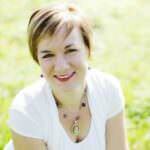 Experienced guides will personally lead you through the course. Expect to spend at least a half day at Crater Lake Zipline; the full course can take up to three and half hours, while the Sasquatch Hollow experience is two to three hours. For dinner, head back to downtown Klamath Falls, 30 minutes south, and treat yourselves to a an easy, comforting meal at Mac and Cheese Steaks — a beloved local food truck that elevates all the classics with extras like buffalo chicken, jerk chicken and Philly cheesesteak. Don’t miss the truffle fries, and creme brulee for dessert. Fuel up before your adventure today with breakfast sandwiches from Gathering Grounds Roastery in downtown Klamath Falls — a local micro-roaster with an obsessive focus on creating the perfect cup of coffee. Then head out to explore what sounds like the stuff of legends: dancing sand and mare’s eggs. 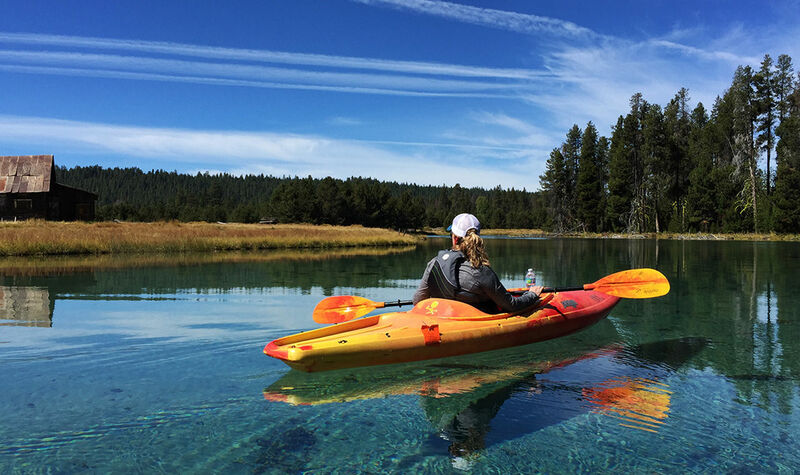 Curious visitors can discover the natural wonders behind them on a kayaking, fishing, paddling or hunting excursion with Real Oregon Experience (ROE). For a family-friendly half-day adventure, try the Spring Creek kayak trip. On this trip, you’ll travel to the headwaters of Spring Creek, where the underground stream comes bubbling up straight out of the earth — the colorfully named “dancing sand.” As you paddle, look into the famously clear water for greenish spheres below the surface — these are mare’s eggs, properly known as nostoc pruniforme. These rare freshwater algae grow in only a few special places on the earth; this is one of them. You can either have your guides drive you to the boat launch or drive yourself, and add in a self-guided visit to the nearby Collier Memorial State Park and Logging Museum. Play in a pioneer village, check out antique timber harvesting equipment and marvel at a 16-foot slab from the largest Douglas Fir tree ever cut. 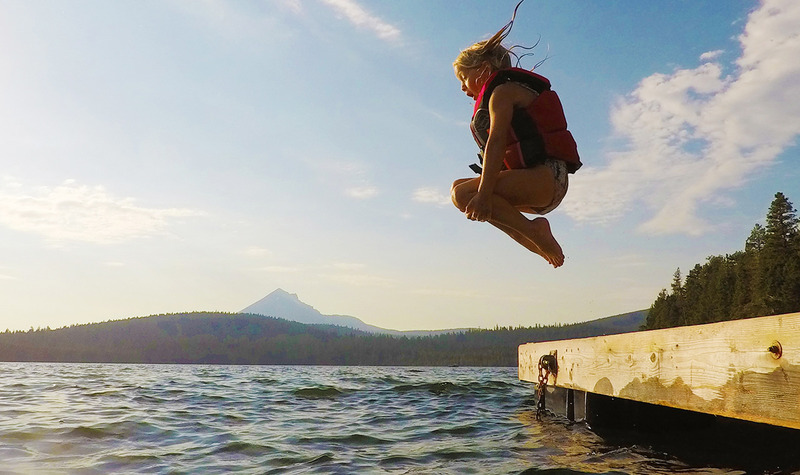 Experience the serenity of an alpine lake at Lake of the Woods Resort, where a marina, vintage cabins and several restaurants are nestled near the crest of the Cascade Range. Rent a boat, canoe or stand-up paddle board at the marina and spend the day exploring the shoreline or fish for some of the biggest German brown trout in the state. Grab dinner at The Lakehouse Restaurant, which serves Northwest cuisine along with local wine and beer, including the aptly-named Lake of the Woods IPA from nearby Klamath Basin Brewing. If you’re at Lake of the Woods Resort on a Friday night in the summer, you can watch a classic movie at dusk in front of the general store; if it’s Saturday, enjoy a family barbecue with live music and dancing. At the end of the day, wander back to the lakeshore. Teach your kids to skip rocks, or sink into one of the colorful Adirondack chairs to admire the reflection of Mt. McLoughlin. Pro tip: If you like, you can also make the most of your time in the region with a Skyak trip: a half-day zip-lining at Crater Lake Zipline followed by a half-day of kayaking with Real Oregon Experience. 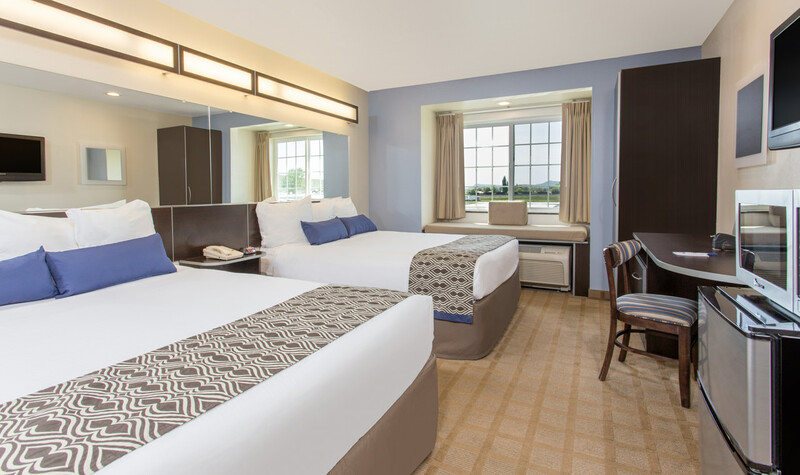 In addition to Lake of the Woods Resort, families will appreciate the two-bedroom suite option at Cimarron Inn & Suites, with separate spaces for sleeping plus an in-room kitchenette. The Cimarron is pet-friendly, and the OC&E Woods Trail runs directly behind the hotel, perfect for walking the dog or taking a family stroll. Traveling with a large family or group? Stay at the Maverick Motel, where you can reserve a four-queen room that comfortably sleeps up to eight. Kids stay for free with their parents, and the motel offers a complimentary shuttle service to and from the Amtrak station or airport. Travelers looking for a convenient homebase in Klamath Falls will find it in the Majestic Inn & Suites, a family-owned inn located close to restaurants, grocery stores and other amenities. Klamath Falls’ newest hotel, Microtel Inn & Suites, is also perfect for families, with contemporary rooms, soaking tubs and outdoor pool, complimentary breakfast and even an arcade and game room. 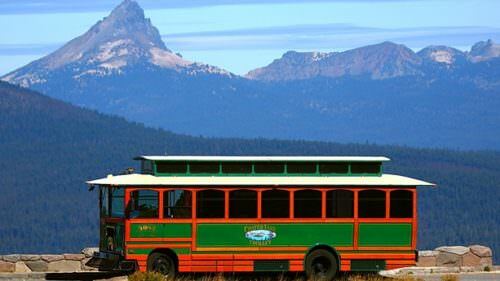 The hotel is right next to the Epicenter— a family fun center, bowling alley and arcade — and a few minutes from the Children’s Museum of Klamath Falls, Crater Lake Trolley and Klamath County Fairgrounds (the county fair is Aug. 2, 2018).